DADaPalooza: Las Vegas Shooting, American Gun Culture, and Australia. Las Vegas Shooting, American Gun Culture, and Australia. I'm feeling very depressed about the state of the American gun lobby, and the seemingly senseless way we handle guns and access to guns in our country. I'm devastated by Las Vegas, yes because of the violence, and the senseless death, but mostly because it's too damned easy for this to happen. I'm afraid it could happen at the coffee shop tomorrow, or at the supermarket, or at the shows I'm performing in. This is actual terrorism at work. It's not a surprise that stuff like Sandy Hook or Las Vegas happens. The only real surprise is it doesn't happen more often. Just about anybody with some money or a credit card and a grudge and the willingness to die in the attempt can get a few guns, hole themselves in a highrise (or a clock tower) and go to town. That it doesn't happen more often is the terrifying part of it, because it doesn't seem like there's much to stop it from happening. I'm not saying that we could totally prevent stuff like this happening, but at the very least we could do some stuff to prevent it. I'm not talking about hard stuff. I'm talking about the easy pickings, the low-hanging fruit. For example banning semi-automatic guns. In 1996, after a massacre about half as bad as Las Vegas (35 people killed) Australia banned automatic and semi-automatic weapons. The guns weren't confiscated, they were bought back by the government and then destroyed. The politicians who did it suffered a minor setback, but have now recovered. And they haven't had a mass shooting of the same scale since. Read about that in a recent article in the Washington Post. The following article Thank you, Australia, for making us safe from gun crimes was printed in the Sydney Morning Herald (June 16, 2016). It was written by Aubrey Perry, a Melbourne-based writer and artist who is originally from the United States. She argues far better than I can the positives of living in a less gun activated culture. She also has an interesting story about finding out that her parents were Trump supporters and confronting them about it. I found this article while I was perusing the website of children's author Steve Cotler. He wrote the Cheesie Mack serie s, which is pretty entertaining and appropriate for 9 year olds. I have only read one so far but plan on reading the rest! Thank you, Australia. Thank you for making me feel safe when I walk out my front door. Thank you for not making me wonder if some enraged lunatic is going to shoot up the post office while I wait in line to mail a package back home to the States. Thank you for not making me worry that my daughter will be slaughtered in a bloody shooting-spree at school, or that my husband might be shot in a restaurant while he has lunch, or that my gay and lesbian friends will be mowed down by a madman with a machine gun at a nightclub. Thank you for honouring and protecting the good of the whole and not the selfishness of the individual. Thank you, Australia, for recognising that guns are not toys. That they shouldn’t be used for entertainment purposes and that they don’t imbue a person with power, nor do they command respect. Thank you for not celebrating them as extensions of masculinity. Thank you for not living in a false reality, on an imagined frontier, where everyday people think they’re super-hero cowboys and that God guaranteed them a gun. Thank you, Australia, for changing a law when the law wasn’t protecting the people it was meant to serve. Thank you for putting the protection of your people above the protection of a doctrine. Thank you for not being fossilised by your constitution. Thank you, Australia, for not accepting the excuses for owning a gun. 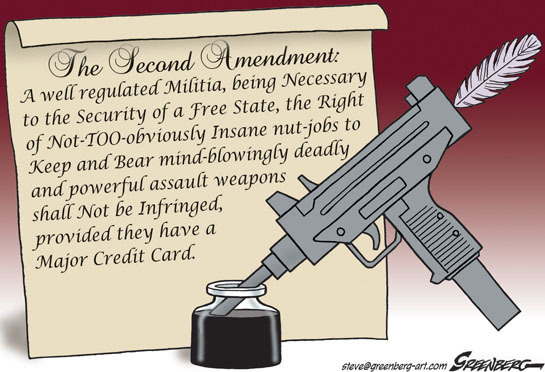 Thank you for understanding that wanting to have a gun to play with at the shooting range on the weekend is a selfish indulgence, not an inalienable right. Thank you for caring about your fellow man more than your gun. Thank you for being intelligent enough to know that more guns don’t make people safer. Thank you for not capitalising on your citizens’ fear while you arm their enemies and make $36.2 billion selling weapons to other countries. Thank you, Australia, for doing the job my country can’t: making its people safe. 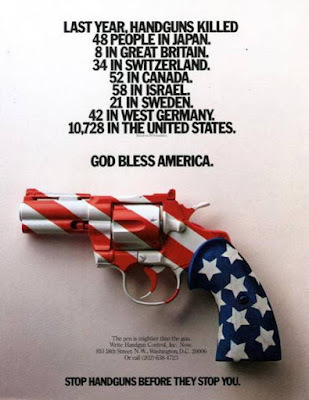 I realise that there are still occurrences of gun violence in Australia, but nothing like there is in America. When we first moved to Australia, my husband and I lived in Fitzroy for three years. Friends questioned our safety there. We usually laughed in response. In a gun culture, there never really is peace. There is a constant, heightened state of alert. In crowded places, the shopping centre, the cinema, school campuses, sporting events, in places where we should feel safe, there is the nagging fear of gun violence always present. You don’t realise the weight of the fear of living in a gunned-up society until you don’t live there anymore. Living here, I am less afraid, less suspicious of my fellow man as well. When everyone has a gun, anyone can be the one who’s going to shoot you. America’s gun laws foster an unhealthy suspicion of its citizens and turn people against each other. An “I’ll shoot you first” mentality is not one of camaraderie and unity. But, fed by fear, it’s the false sense of power and control that a gun provides that does the most damage to a society. Instead of being frightened of the next random act of terrorism, people are afraid of each other. So what do they do to control that fear? They buy a gun to defend themselves. Yet not one of the 62 mass shootings in the United States over the last 30 years has been stopped by an armed civilian. So I watch all of this from a safe distance, in a safe country, and I feel almost guilty for my gratitude. I’m an American. I’m proud of my country for so many things, but for this, for these countless acts of preventable violence, I am terribly, terribly ashamed. When the Sandy Hook Elementary school shooting happened, I watched from my sunny living room while my almost one-year-old daughter crawled around the Christmas tree. It was summer here, Australia at its best. A warm breeze, sun glinting off the pool in the backyard. But on the television screen was the worst horror I could ever imagine. So many dead children. So many unopened packages beneath so many trees. So many cold little beds. So many birthday parties that would never come, graduations, weddings, families that would never be and so many families that would never be the same. My body ached for them as though those children and those families were my own. I could never imagine something so horrible happening to my child, a man-made bullet tearing through her tiny body, stealing her future from her and that love from my life. I sat there and watched the parents scream. I watched the tears. I watched the friends and family try to console. I was angry. I was sad. And when I picked up my daughter and squeezed her and held her to me and kissed her baby-fat cheeks, I was grateful. I was grateful to live here in a country that does more than say gun violence should be stopped. It’s done something about it. Thank you, Australia.